As famous as he is from his impressive amount of wins and records, he is as infamous because of his bad beat tirades. For 'The Poker Brat' the successtory started when he dropped out of school and started to play fulltime poker. This resulted in 11 bracelets and 63 cashes in the WSOP, and we haven't seen the last of him yet. 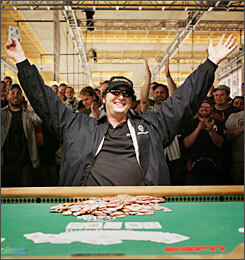 Phillip J. Hellmuth, Jr. (born July 16, 1964 in Madison, Wisconsin.) Phil was the oldest of five children, and according to him his youth consisted of nothing but school, homework and studies. 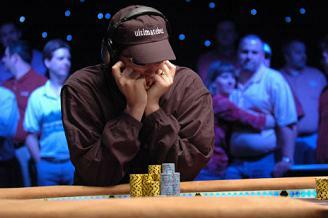 When he was 19 Phil quit his studies at the University of Wisconsin to become a poker pro. He proved it was the right choice by becoming 5th in the 1988 WSOP seven-card stud high-low tournament. This was the start of a legendary series of wins and cashes. At the age of 24 Hellmuth won the 1989 World Series of Poker Main Event, beating Stuey Ungar's record as the youngest player to win the WSOP. With a record total of 11 WSOP bracelets (3 of them in one year, in 3 consecutive days!) and 63 cashes he earned a place in the Poker Hall Off Fame. When it comes to the record of most final tables, Phil is in good company: he shares the lead with T.J. Cloutier with an amazing 39 tables. "If luck weren't involved, I guess I'd win every one"
"That’s why I make millions of dollars a year playing poker"
"I've revolutionized the way to play Texas hold 'em"